Review the Race Checklist and the Race Weekend Guide, sent on Monday before the race. We have listed the most commonly asked questions and answers on the FAQ PAGE. Please read through the list of questions prior to the race. Athletes and parents are also encouraged to attend an orientation session prior to their race. Arrive at the Wave Calling tent prior to your wave being called in. Waves will be escorted onto the pool deck in order starting with the 3 – 5 age group, wave # 1. There are 8-12 athletes in each wave. Athletes in the 3 – 5 age group MUST be accompanied by an adult in the pool. Even if your child can swim unassisted you must be within arm’s length of him/her in the pool. Come prepared to get in the pool. Parents will be able to walk across the width of the pool. Life jackets are permitted for any athlete regardless of age and will be handed out on the pool deck. We supply the life jackets. Flutter boards, water noodles or fins are not allowed. Puddle jumpers are permitted. Water wings are permitted in some locations only – the pre race newsletter will confirm the venue’s rules around floatation devices. No running on the pool deck at any time, even on the carpet. The race will start ‘in water’, no jumping or diving into the pool. Everyone will finish their swim in the shallow end. Athletes are responsible for counting their own laps. Our Swim Captain, life guards and volunteers will be on the pool deck at all times. Depending on the venue, spectators will either view from a viewing gallery or on the pool deck. There will be a separate swim exit, for athletes only. Spectators will exit the same way they entered the pool area. Timing chips will be in the form of a sticker placed on the BACK of the race bib. 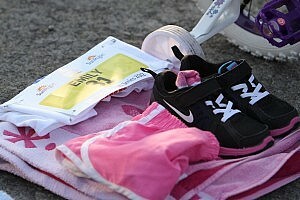 Race bibs cannot be worn in the water. Athletes enter the transition area, after their swim, walking or running down the swim chute path. Athletes in the 3 – 5 age group will have a separate transition area. One parent will assist athletes in transition for this age group. For age group 6 – 7 and older parents are not permitted in the transition area during the race. Volunteers will be guiding and assisting in transition. The transition area is a large, secured area near the swim exit. It is the area where athletes transition between the swim – bike and the bike – run. Athletes will place (rack) their bikes, helmet on the designated rack, with their gear placed under their bike. Bike racks will be marked with AGE GROUP signs which are the same colour as the race bib. After the swim athletes will find his/her bike with the assistance of volunteers. Athletes dry off with their towel and put on shorts and a shirt over their bathing suit with their race number already pinned on. Transition Volunteers will assist all athletes with everything from helping dry off, tying shoelaces, putting on shirt/shorts, buckling helmet to unracking bikes and of course, offering tons of encouragement. The athlete takes his/her bike and heads to the exit of transition towards the BiKE flag. The bike cannot be mounted until the athlete passes the “ON MY BIKE” sign. Bike helmets must be worn with chin strap buckled at all times while the athlete is in contact with the bike. All athletes must have a well maintained, safe bicycle or tricycle and must wear a properly fitted helmet with a working chin strap. Bike inspection is not mandatory, but it is recommended. Training wheels are permitted at any age. Glider/Balance Bikes are permitted in the 3-5 age group only. Helmets must be buckled before taking the bike from the rack. Follow this link for five easy steps to fitting your helmet properly. Great information! NO SHIRT=NO RACE Torsos (chest and stomach) must be covered during the bike and run (female and male). All athletes must follow the directions given by race volunteers wearing red VOLUNTEER shirts. Failure to follow the directions of the race officials, the use of profanity (athletes and parents) and putting the safety of other athletes at risk will not be tolerated. No riding bikes in the transition area. Athletes will be directed to the ON MY BIKE sign, located outside the transition area. Volunteers will assist with a safe ‘bike start’. Please make sure your athlete(s) understand the bike looping process. Show them where you will be standing to count their loops. After they have completed the bike portion, athletes will dismount their bikes at the OFF MY BIKE sign and head to the ‘Drop Transition’. They will HAND their bike and helmet to a volunteer and head off on the run course. There will be one water station on the run course. Older age groups will pass the water station several times at some venues. Most run courses are laps of a field where the older age groups will complete several laps before finishing. Parents play an important role in the race! Be sure your child knows how many LAPS in the pool and LOOPS of the bike and run course they are required to complete. It is the responsibility of the athlete and their parents to keep track of completed loops. The number of laps and loops will be printed on the athlete’s race bib and can be torn off for parents to keep in hand. Call out the loop number to your child … “one more to go”. Make a sign! Be sure your athlete knows where you will be standing to count loops. We will take this opportunity to remind participants and parents that this is a non-competitive event series and we are not disqualifying, holding back or adjusting times for any participant who does not complete their required distance. Results are posted in alphabetical order and not in finishing order. bicycle (road bike or mountain bike) or tricycle. Training wheels are allowed for any age group. No scooters permitted. race bib – pinned to the front of the shirt you will be riding and running in. Be sure to check your child’s helmet before race day. Inspect the helmet for cracks or chips and make sure it fits your child properly. The helmet should feel snug and not slide around with movement. The straps should form a V-shape around each ear and the chin strap must fasten securely. Helmets that are not fitted properly are less likely to protect your child from injury. Visit your local bike shop if you are unsure of the proper fit for your child or take a look at this guide. We recommend that you take bikes in for a pre race bike inspection the week before the race. Inspections at a bike shop will include checks on brakes, steering, wheels, inflation pressure, tire condition, chain, and pedals. Although bike inspection is not mandatory, it is strongly recommended. Check each event page for our bike shop partners and visit them for your pre race bike inspection. ⋅Torsos must be covered for the bike and run portion of the race. This rule is for both girls and boys. You will be asked to return to transition to put on a shirt. Sleeveless shirts and one piece bathing suits are permitted. This means no belly button showing. ⋅Clipless pedals are permitted at any age, with the following conditions: for ages 13 and under, the cleat must be recessed into the cycling shoe, such that the sole of the shoe, not the cleat, makes full contact with the ground. The athlete must be able to clip into both sides of the pedal. For ages 14 and up, all clipless pedal systems are permitted. ⋅Cage pedals are NOT permitted at any age. ⋅ONTARIO and ALBERTA only: Aerobars are permitted for the 14-15 age group only and must not extend more than 15cm beyond the front wheel axle, and they must not be longer than the brake levers foremost line and must have a solid bridge. In BC Aerobars are NOT permitted. Ask for clarification prior to the race if you are unsure of equipment rules.